White water rafting, fly fishing, and ziplining in Gallatin, Montana. When we planned our trip, we thought it would be good to schedule a couple of days outside the park here and there just for a change of pace. On our third day, we drove north from West Yellowstone to Gallatin. It’s an easy drive, but like much of the area we drove through on this trip, cell service is spotty at best. 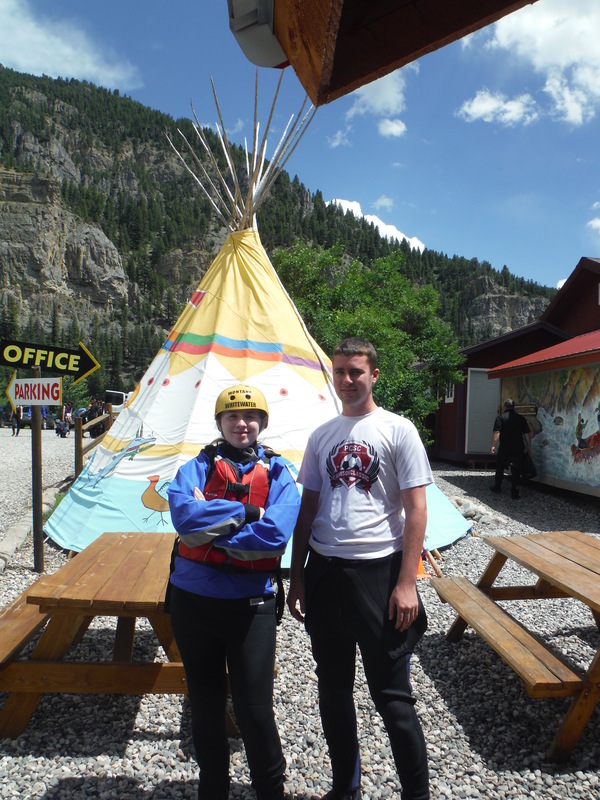 We booked our adventures through Montana Whitewater and everything went smoothly….well, at least until my son’s nasty stomach virus hit me, just after we finished ziplining and (thankfully) before I got on the raft. Anyway, most of our group opted for the Zip and Dip package (a zipline tour and rafting), while the rest of our group opted for Cast and Raft (fly fishing and rafting). I was in the Zip and Dip group and it was a gorgeous, but slightly chilly, day for ziplining. Our guides were fantastic. They had a great sense of humor, made sure we were all safe and comfortable, and made the experience really fun. The zipline course had a few “challenge” elements to it, such as sky bridges, and we got to zip over the Gallatin River twice. In case the Gallatin River doesn’t ring any bells for you, I should mention that this is where they filmed parts of the Brad Pitt movie, A River Runs Through It. We even got to see what our driver semi-facetiously called “Brad Pitt rock” on the way to the put-in spot for rafting. You may recognize it from the well-known DVD cover image. 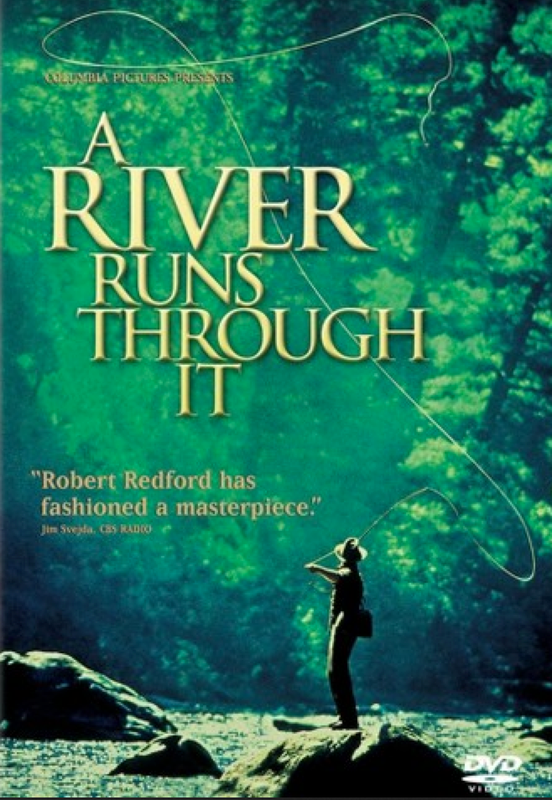 You would never know it from that image, but the rock is at a place in the river that is easily seen from a very busy highway that runs parallel to the river – a far cry from the isolated peaceful fishing spot that is implied in the movie. The guide was friendly and patient, graciously untangling lines again and again as our inexperienced fly fishers practiced casting. As my daughter explained: “I tangled my line around itself, my own leg, under rocks…basically everywhere I could put it except near a fish.” Even though they didn’t catch anything, they all said they had a good time. The kids, ready to raft. From there, our two groups came back together to get ready for rafting. The outfitter provides full wetsuits as well as helmets, lifejackets, and splash gear. It’s a lot of stuff to put on so allow some time to get your gear and get it on. From there, you’ll board a bus to the put-in spot. Our group split again with some of us opting for the easier course and some going for the tougher one. It was about at this point that I started to really not feel well. The day before, my son had come down with a stomach ailment that left him extremely nauseated and tired for most of the day, but by the next day, he was mostly fine. However, it seems he passed it along to me, making the bus ride to the put-in spot…unpleasant…to say the least. If you’ve never been bundled into several layers of clothes, including a wetsuit and fleece, then stuffed onto a hot, crowded bus for a 20 minute drive, all while struggling to hold onto your lunch…well, count yourself lucky. By the time we got to the put-in, I knew that there was no way I could get on that raft. Not only would I be miserable, but I would also be useless to my raft-mates and would likely make things very unpleasant for them. I mean, no one wants to see someone yakking over the side of the raft, right? Instead, I white-knuckled it on the return ride back to the outfitter’s office, where I was stranded until the rest of my group finished rafting. My husband had the car keys in his pocket, out on the river somewhere, so I was stuck in shorts and a bathing suit without even a pair of shoes. I’ll spare you the details but once I gave up the fight to keep my lunch down, a wave of complete exhaustion overcame me. I ended up sleeping on a picnic table bench using the outfitter’s life jacket as a pillow and the fleece top as a blanket. 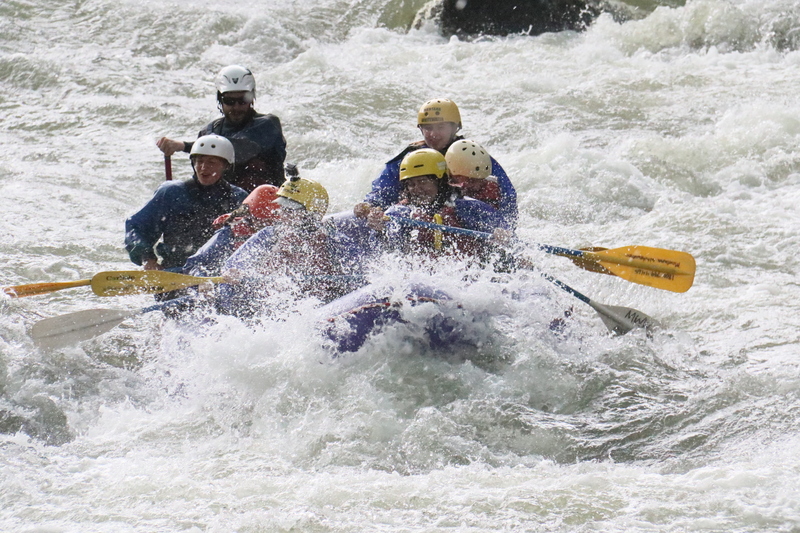 It was a good thing I had opted not to raft, as much as I really hated to miss it. All was as well as it could be until I woke up as a storm rolled in and the temperature dropped. Then, just like at our ill-fated cookout the day before, the hail started. Given that I get chilly when the weather dips below 70°F, I was absolutely freezing. Still ill, I took cover in the equipment shed, huddled among the wetsuits as hail pounded the roof. To say I was absolutely miserable doesn’t even begin to cover it and I was counting down the minutes until my husband’s group got back from rafting so that I could at least change my clothes and get in the warm car (and most of all, go back home to the cabin). When he finally got back, he had no idea that I had been sick and never went rafting with the other group. Once he figured it out, he lost no time in getting me into warm dry clothes and into the car for the hour-long ride back home. Rafting fun, before the hailstorm hit.